There's no better way to immediately give a party a festive atmosphere than with a big bowl of punch. This cranberry-flavored version uses white rum and champagne for a potent, sparkling concoction that's sure to be a hit at your holiday fête. 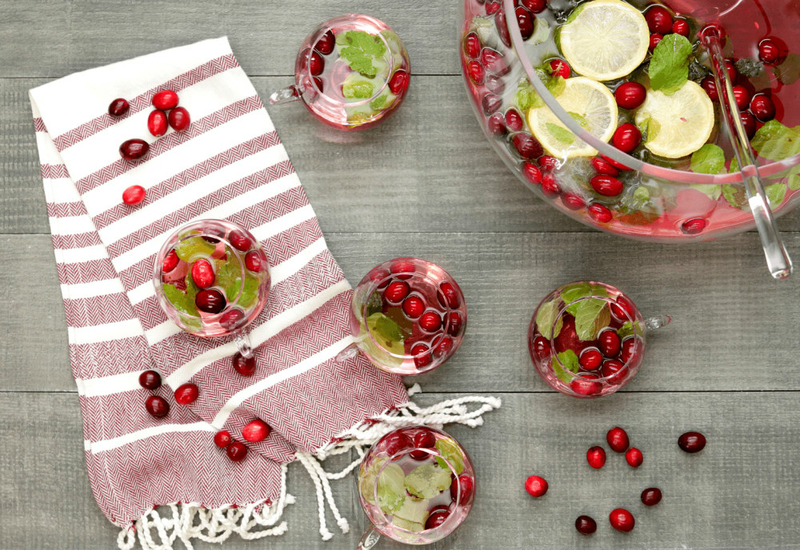 Garnished with mint leaves, fresh cranberries and sliced lemon, this colorful punch makes a beautiful centerpiece and isn't too sweet. Make the ice float ahead of time, and all you need to do before the party starts is add everything to the punch bowl. For old-school presentation, try freezing the water in a bundt pan to make an ice ring. The larger the ice cube, the longer it takes to melt! The ice ring ensures there's no watered down punch with this recipe If you like, substitute unsweetened pomegranate juice for the cranberry juice and garnish with pomegranate seeds in place of whole cranberries. Per Serving: 104 calories; 0g fat; 5.8g carbohydrates; 0g protein; 0mg cholesterol; 5mg sodium. This champagne punch was right up my alley! I made it for a group of girlfriends at a brunch I hosted at my house. It was gone before all the food! Next time I'll have to double the batch! It was so simple to make, which I love! It's a must try any time of year. My wife made this cranberry champagne punch recently and it was really good. Use a decent bottle of champagne and rum, and you've got yourself a high-end tasting, delicious drink. It's perfect for brunch! This recipe is perfect to make when you are entertaining. I didn't use a high-end champagne or anything, and my guests loved it. Super easy and fun! Delicious champagne punch! I used a rose champagne, and it was really good. I also added a little more rum! This champagne punch worked great. I actually doubled the batch and served it at my housewarming party. I also added fresh strawberries to the punch bowl. If you're using glasses, I suggest adding a little sugar to the rim. It was a big hit with out guests.